Wayne Rooney, potentially the greatest footballer ever to play in the Blue of Everton, is, if press reports are true, available for transfer. Is now the time for Rooney to return to Everton and fulfill the massive promise he demonstrated as a 16 and 17-year-old before he controversially moved to Manchester United in the summer of 2004. The Wayne Rooney story is so brilliant it is almost unbelievable. A young Evertonian, growing up in a deprived area of the city was born with a talent so fantastic, that as a 16-year-old he scored one of the all-time great goals to defeat Arsenal, the then Champions of England. At 17 he was representing his country and took the world by storm, with a quite mesmerising display at the European Championships. His performances were so good that the World’s biggest clubs came calling and after declaring a wish to transfer, Rooney was sold to Manchester United. Colin Harvey, a true Everton legend and part of the clubs famous Holy Trinity (Kendall, Ball and Harvey) was instrumental in the development of Wayne Rooney. As the Head of the Everton Academy at the turn of the millennium, Harvey is perfectly placed to speak about Wayne Rooney and back in 2010 he spoke to the Daily Record about his prodigy’s huge potential. “Wayne’s the best young player I’ve seen, the best Everton have produced and he can become one of the greatest English players of all time. “I remember the first time I saw him. I was in charge of the under-19s and under-18s but I used to go to the club’s youth training complex on Sunday mornings to take in a couple of games including the Under-16, 15 and 14 sides. “Just as I got over there one Sunday a kid picked up the ball on the halfway line, beat four players and stuck it in the top corner. He was only 11 and it was a joy to watch. “Every time you saw him he did something that took your breath away. He was nine when he was first signed for Everton by the club’s youth director, Ray Hall, and in 1994 he went on to score 99 goals in a season for the under-10s. “When he was 13 I took him to Coventry with the Under-18s and he was giving away five years to all the other guys. “Wayne went on as a sub and scored a stunning goal. From that moment he never looked back. A move for Rooney seems an impossible dream. Clubs with huge financial resources would be incredibly keen to sign a player of such fabulous ability. Rooney is currently receiving a weekly salary in excess of £200,000 a week, way above anything Everton could afford to pay. Clubs with almost guaranteed access to the Champions League are rumoured to be chasing his signature and although Martinez has a dream to return Everton to former glories, the chances of winning regular silverware would be best served elsewhere. But there is one thing that Everton can offer that no other football club in the world can offer Wayne Rooney and that is a true home. 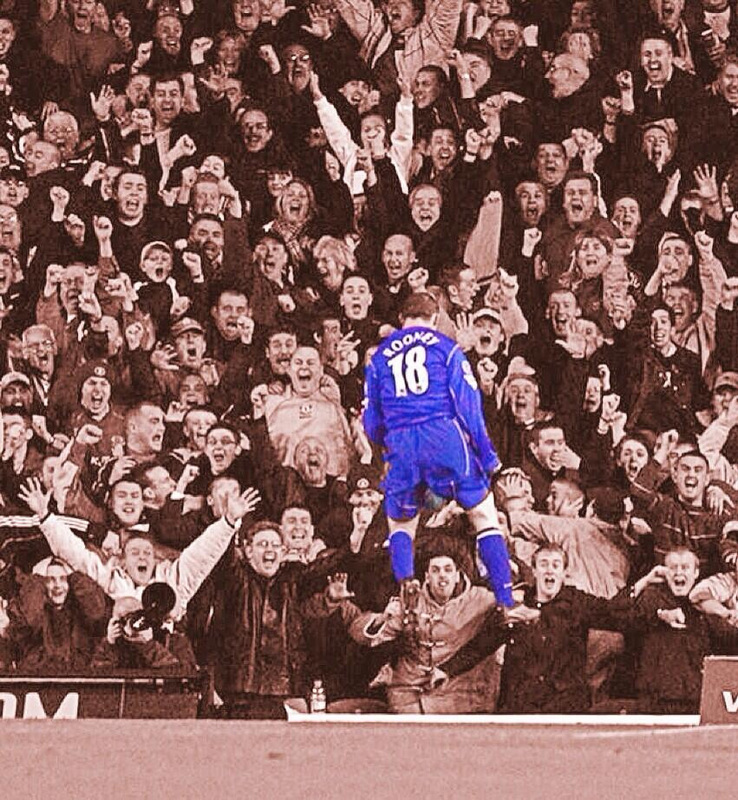 Rooney is a Blue, despite what has gone before, Rooney will always be an Evertonian and the desire to achieve at “his” football club must burn strong. It would be a transfer for the romantics, proof that football is about more than just money and it would propel Everton back into the footballing stratosphere. Goodison Park would become the hottest venue in town, tickets to watch the Blues will be like gold dust, with Toffees from all over the Country clambering to see Rooney in action. Rooney 18 shirts, would sell in their thousands, not just in England, but across the world. TV companies would be camped outside Finch Farm and Everton would be a regular attraction on the Sky and BT platforms. Can it happen? Who knows? Would Martinez want to bring in such a huge personality into the Everton dressing room? Again, who knows? Wayne Rooney will always divide opinion between Evertonians; but now is the time to forgive and forget. Everton should be doing all they can to engineer a move back to Merseyside for Rooney who could finally justify the tag as the greatest Everton player of all time. It is time to come home Wayne!!! 9 years of abuse from everton, arsenal, chelsea, city, liverpool fans and now cause he’s (rooney) fallen out with Utd, you hypocrites are wanting him back. Not everyone hated Rooney, many were disappointed with the way he responded after he left, but majority of Evertonians would be pleased to have him back. Terry, read Man United comments on Sky under the recent Rooney story. He has played a huge role in bringing you glory and this is what you think of him? I feel the hypocrisy is all United’s. He plays his heart out and all you do is sing anti-scouse songs. We loved him. He was one of our own. We were devastated when he left. We actually had a world star international… and he left for United. I’m sure you’d have been the same if Giggs, Beckham and co had come through and left United to play for a bigger club. Now he has been re-united with Moyes, who he hates! Maybe 70% of Everton fans would want him back. But if he did come, we’d all be behind him. He is one of ours and I’d have him back right now, bathe him in Hoy Water to wash your stench off him and then get him back in the royal blue of Everton! No more hypocritical than after 9 years of chanting ‘Rooneh’ you lot want shut of him, with half the phone-ins declaring he was never that good anyway. Listen to what your saying, rooney is motivated by money and money alone if he was a true blue he would take a pay-cut and force a move back but we all know thats never going to happen in fact of he loved everton so much why didnt he stay in the first place and try and achieve these things at everton? No he chose to achieve with a team that doesnt mean nothing to him. Hes said he wants to goto chelsea therefore he isnt interested in returning anytime soon. He wants to win with others then expect a cushy number at us before he retires. Rooney will never play in a everton shirt again! There is no-way he’d come on the wages we’d be able to afford. But it is an interesting question – would you swap Fellaini and Baines for Rooney?